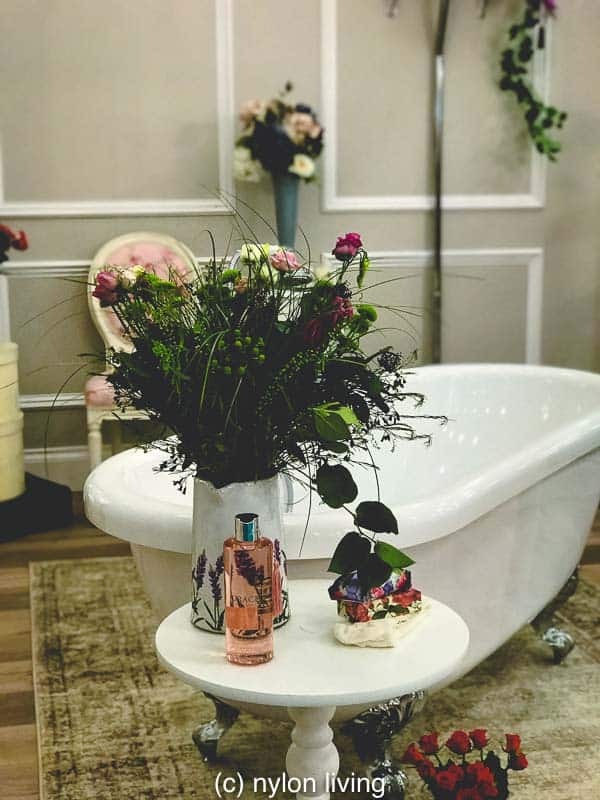 If I had my own bathroom I would totally have this romantic bathroom filled with flowers that I saw at the Ideal Home Show in London. Unfortunately, I share the master bathroom with my husband and he would find this look way too girly. 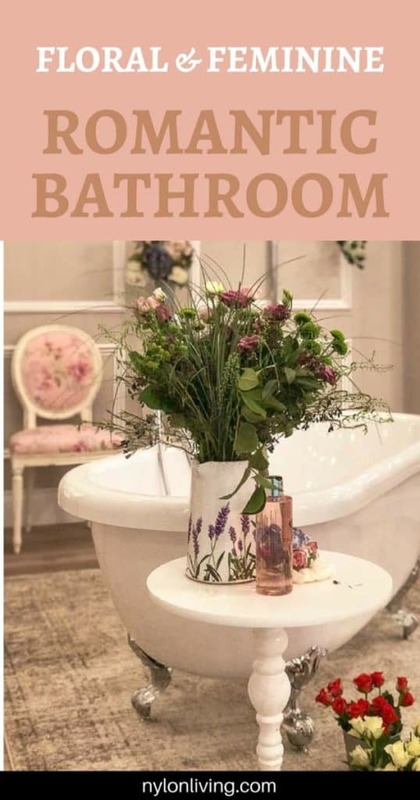 This room set shows that Inspiration and ideas that shows a floral bathroom can be a romantic bathroom. And, if he objects? 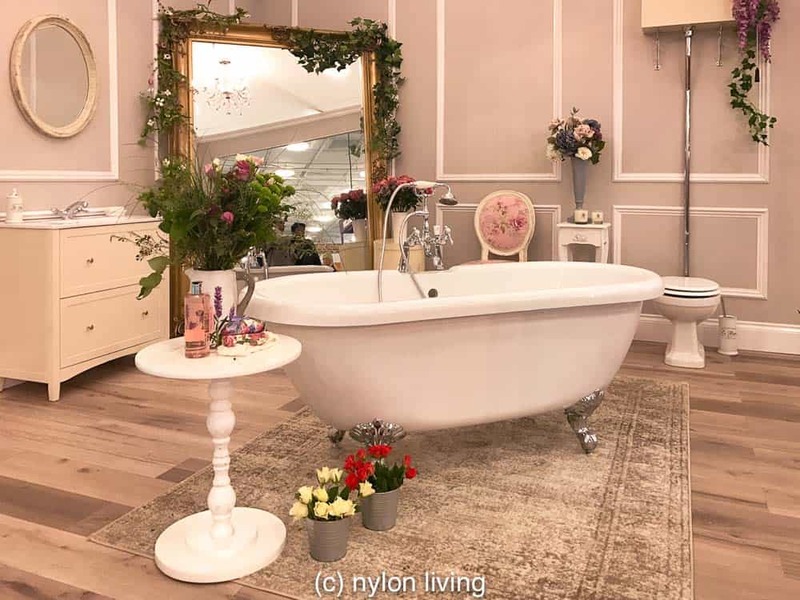 Go on and set yourself a romantic scene in the bathroom where you can sink into a deep-soaking tub with a good book and a glass of wine. Decor ideas to steal from a floral romantic bedroom. 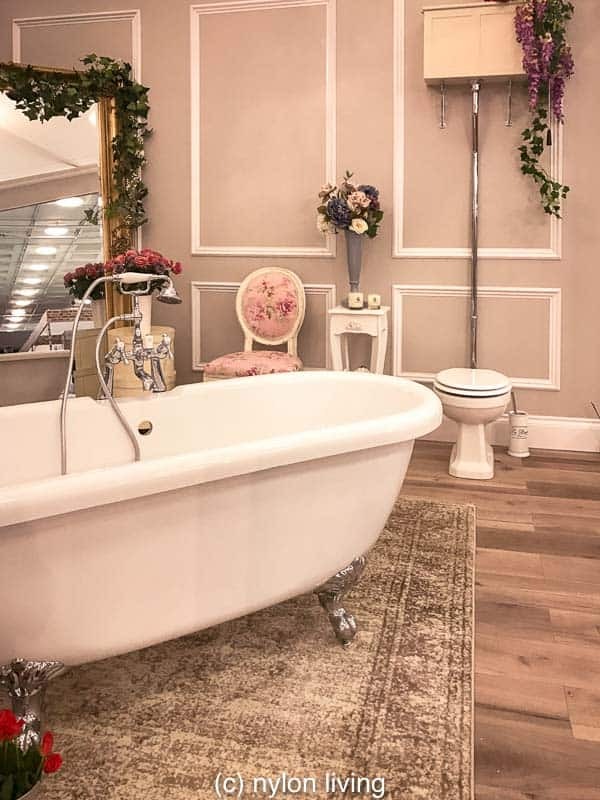 This romantic floral bathroom is unabashedly feminine with its floral bouquets, stand-alone tub and wood panelled walls. 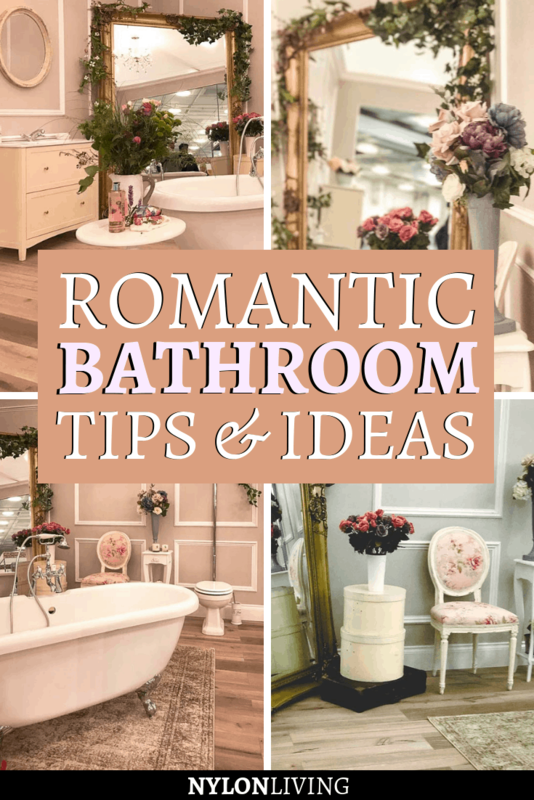 Setting a romantic scene in a bathroom can be for yourself! It would be my idea of heaven to have some uninterrupted soaking time with a glass of wine and a good book. A large floor standing mirror adds drama to the bathroom. The bouquets of flowers are set at staggered heights and are different sizes. A deep soaking tub takes center stage in this bathroom. Don’t forget someplace to sit and dry off. If you are lucky enough to have the space, a dressing area is a nice touch in the bathroom. Flowers, flowers, more flowers. Hopefully you don’t have allergies. 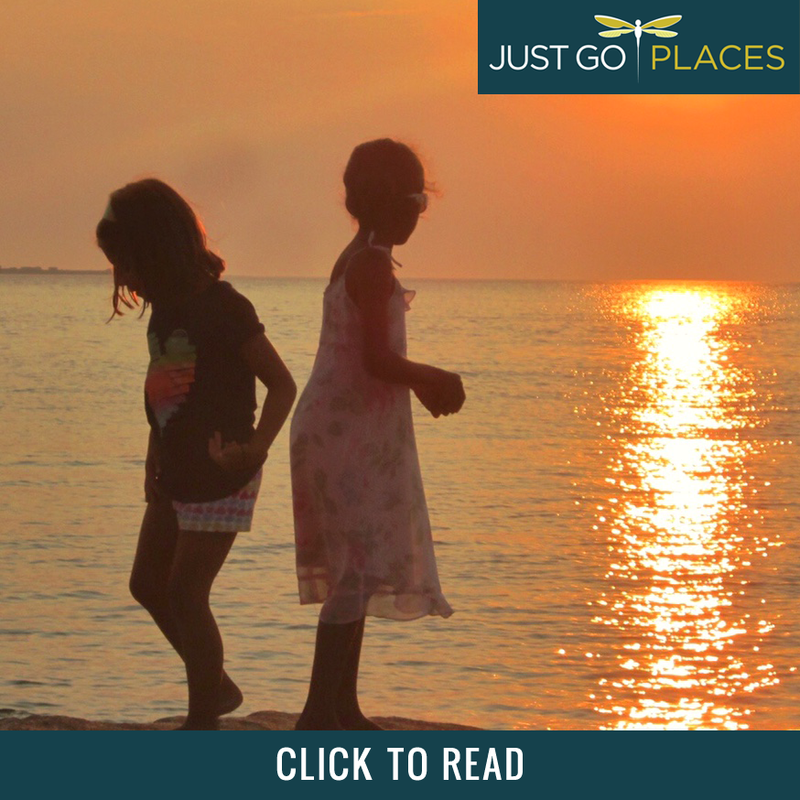 As you would expect, all of the items in this installation sponsored by Victoria Plum can be found on their website. If you are in a shared space, you can still have a romantic bathroom that is floral-inspired. For example, in our last house I used this Portiere wallpaper from Designers Guild. Although floral, this pattern has a strong grey background and a painterly aspect which prevents it from being twee. 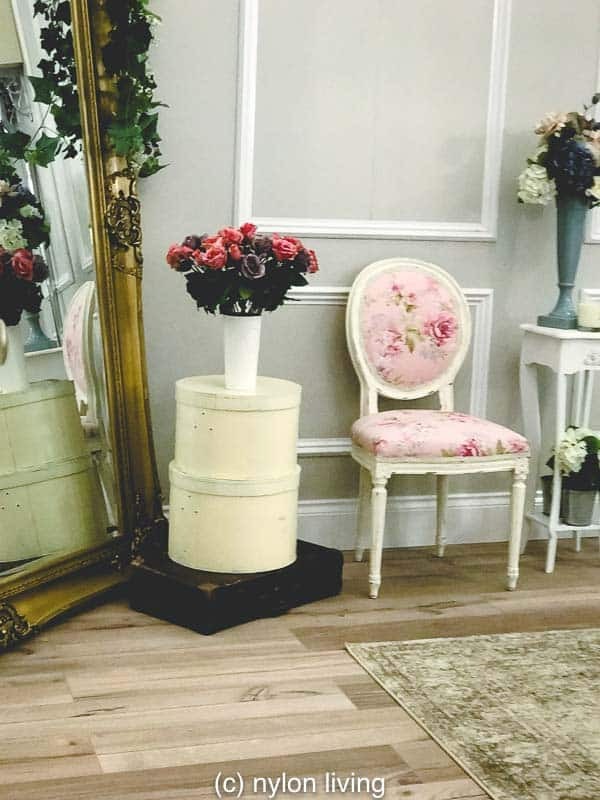 Designers Guild has a lot of pretty floral wallpapers which are both sophisticated and pretty. 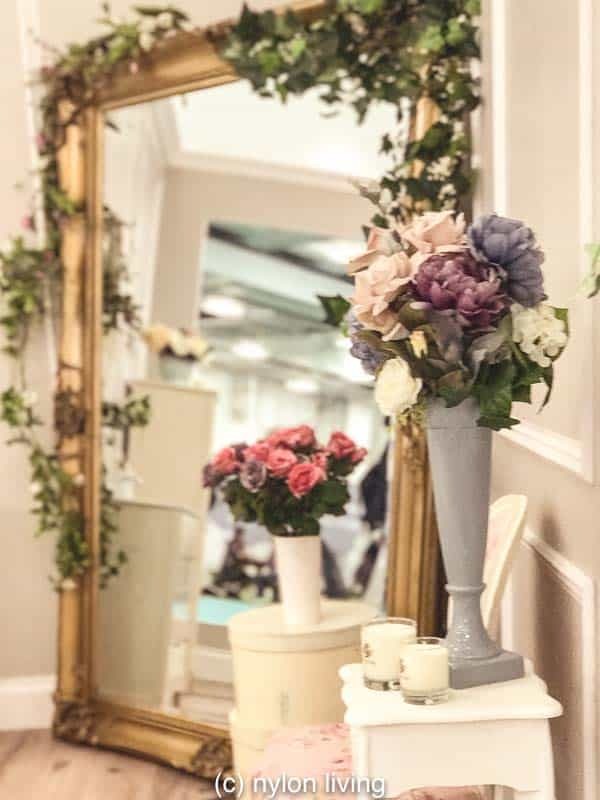 I am also a big fan of Abigail Ahern and her faux flowers. 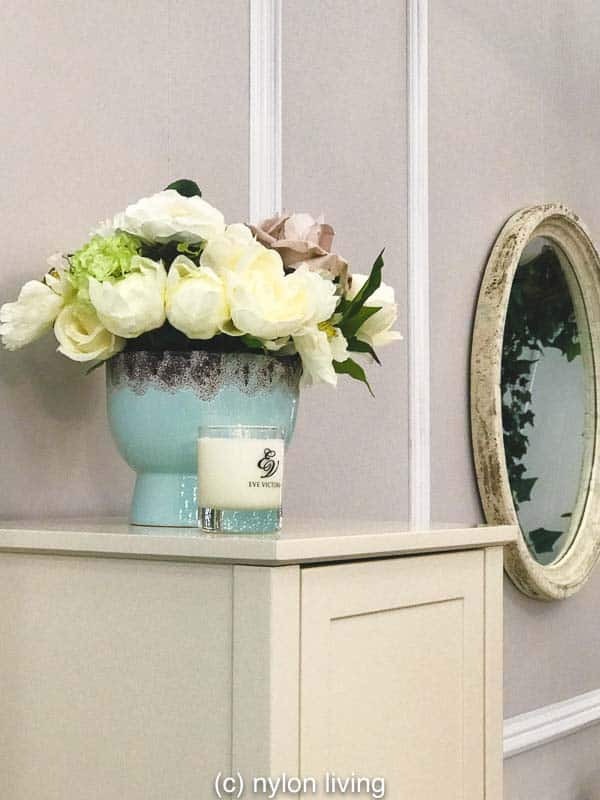 We have vases scattered throughout our house (including the bathrooms) of high-end faux flowers. These fake flowers now looking amazingly real and not plasticky at all. I mix in the faux flowers with real cut flowers. As much as I like flowers, it would cost a small fortune to keep me in real flowers every day! The one thing I do miss about real flowers is their scent. I picked up a tip from Abigail Ahern on how to add a glorious spicy scent to your home – Santa Maria Novella pot pourri. You used to be able to get this divine pot pourri on Amazon but they seem out of stock. So it’s either visiting one of their stores overseas or going to Florence to stock up. I know, such a hardship. I like the grey-pink of peignoir, one of the newer colors from Farrow and Ball. It’s a greyish pink color that is reminiscent of an old-school silk negligee that you see in vintage Hollywood films. If you are concerned about wood flooring in the bathroom, there are plenty of great options for wood-effect porcelain tiles. We have had Amtico wood-effect vinyl flooring in a bathroom which was delightful with underfloor heating on a cold winter’s morning. 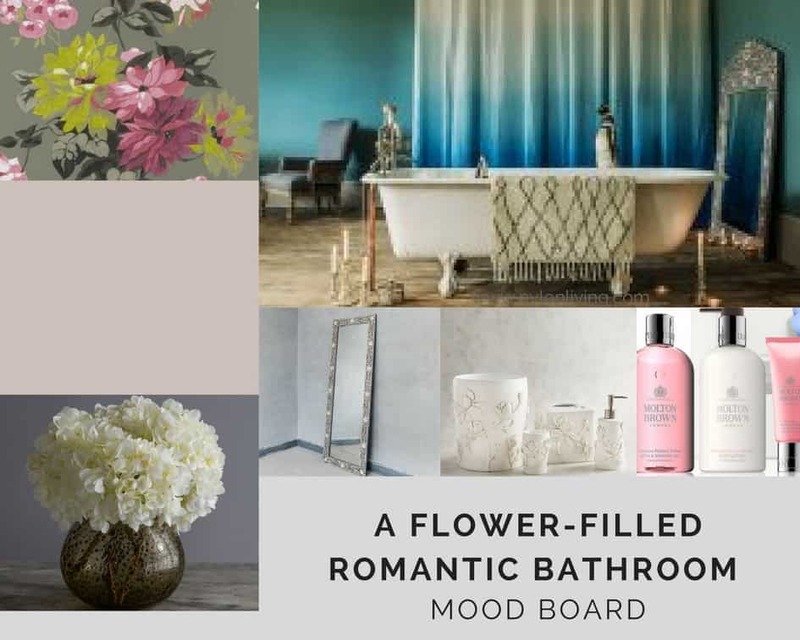 Like the look of these romantic bathroom ideas? Spread the Word! Pin this to your Pinterest Boards for future reference!